An international interdisciplinary team of virologists and biochemists that includes scientists at Freie Universität has developed low-cost and "cell-friendly" nanogels that can efficiently prevent viral infections. The flexible nanogels mimic cell surface receptors where several viral families bind. Pathogens adhere to the nanogel molecules, so the likelihood of an infection of cells decreases significantly. The researchers in the project are based at the Potsdam Institute of Biochemistry and Biology and the Indian Association for the Cultivation of Science as well as the Institute of Chemistry and Biochemistry and the Center for Infection Medicine, both at Freie Universität. The interdisciplinary cooperation was funded through the Collaborative Research Center 765 of Freie Universität and the German Research Foundation (DFG). The research findings were published online on ACS Nano. Medical research faces innumerous challenges due to the vast number of viruses that exist. Most drugs available today are effective against only a single virus or a few similar ones because they only block specific viral proteins to disrupt the viral replication cycle in the infected cells. In addition to possible side effects of these substances, the emergence of resistant virus strains represents a serious medical hazard. 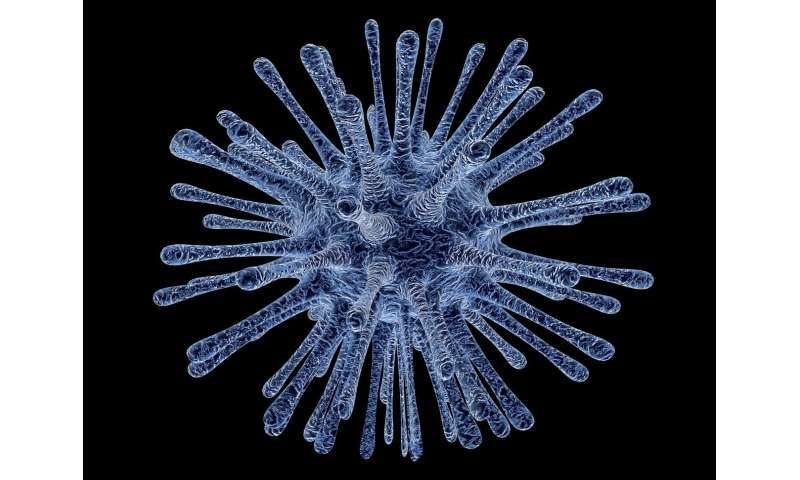 Many viruses share some similarities despite their variety of species and morphology. Often, they interact multivalently with specific receptors and co-receptors on cell surfaces, which they use for initial contact and diffusion into the interior of the cells. The breakdown of the complex mechanism of cell–virus interaction is thus a key research area for developing effective broad-spectrum antiviral agents. Heparan sulfate (HS) proteoglycans form entry ports for a variety of viruses in the cell membrane. So far, various types of nanoparticles have been designed to block viral entry via the HS molecules. They are based primarily on rigid materials such as gold and silver particles. Little research has been done on softer and more flexible substances as an alternative. The German-Indian research team has now succeeded in developing nanogels with different degrees of flexibility that mimic cellular HS proteins. The active compound based on dendritic polyglycerol sulphate can effectively and permanently bind and shield viruses, thus preventing infections. These nanogels offer the advantage that they can flexibly adapt to the virus surface. This increases their multivalent interactions with the virus particles and reduces the likelihood that the pathogens will be able to detach again. The researchers synthesized two sulfated nanogels that work against herpes and arteriviruses in humans and other animals. The generated nanogels can achieve an inhibitory effect of up to 90 percent. The substances remain active for a relatively long time and also provide protection against virus particles released from already infected cells. Nanogels can be prepared at very low cost compared with the production of conventional antiviral drugs. Thus, they can increasingly also be used to treat animals. In addition, the polymeric gels are harmless and "cell-friendly" – unlike rigid, inflexible materials – and can be broken down into smaller fragments and excreted by the kidneys.